I have been thinking a lot about this concept of addictive health lately. I really believe it has legs. In my last post and in a recent talk, I remarked how addicted people are to their smartphones (checking them 150 times/day). I then compared that to data showing that the mere additional act of pushing one button negatively predicted engagement with our connected health program to improve blood pressure control. We practically salivate to check our phones but ask someone to push one button to improve their chronic condition and it’s too much to ask. This is a weakness in how the health care delivery system views chronic illness management. Clearly we could make mobile health addictive (if mobile phones are addictive), but we have not thought of it in this way. Is there a way we could unobtrusively and almost subliminally slip in a health-related message while you’re checking your beloved smartphone screen? The advertising industry is onto something similar. The most basic example is pop up ads that appear in your web browser, especially those that are targeted to your previous browsing behavior. A more sophisticated version is Facebook Home, which can be downloaded to some types of Android smartphones and, when installed, presents updated Facebook information on the phone’s home screen before you get to whatever it was you wanted to check. There is also the example of product placement on your favorite TV show (I always chuckled when I saw the government agents on 24 using Apple computers). We have a lot to learn from the advertising industry when it comes to health messaging. There are numerous other examples of working product-related messaging into your life in ways that you don’t find too obtrusive. Figuring this out for health will be more challenging. Here are a couple of differences I thought of, and I’m sure there are others. Healthy behaviors are not as easy to manipulate as purchasing behaviors. So, we will have to substantially re-organize the health care economy in order to support these types of motivational tactics to improve health. For now, let’s assume we can get there and that your smartphone screen will be the focal point of this new health delivery model. In my last post, I mentioned three strategies (Make it About Life, Make it Personal and Reinforce Social Connections) and three tactics (Employ Subliminal Messaging, Use Unpredictable Rewards and Use the Sentinel Effect). I saw a talk recently by Dr. Michael Roizin and he described this phenomenon as ‘fun and edgy.’ Our health care culture, particularly in training doctors, is still centered on the notion of acute care delivery. If you are acutely ill and need something fixed, we can probably get to the point and fix it without a lot of verbal fanfare. When we transition to an environment of chronic illness management and prevention, this logic falls flat. The conditions (hypertension, diabetes, metabolic syndrome) are all silent and the pay off of treating them is abstract (avoid heart attack or stroke down the line or a year or two of additional life span). In that context, messaging like, “You are 10 pounds too heavy. You should lose some weight,” is not very effective. The trick seems to be making the message and the payoff less clinical, less technical, less abstract and more focused on some aspirational goal that you have (“I want to be less winded when I walk around on vacation.” Or, “I want to enjoy my grandchildren.”). Effectively implementing this strategy will require a couple of important changes. One is to change medical school curricula and teach students early on about patients’ mindset about treating an acute illness versus chronic disease management and how to implement effective behavior change programs. The second will be to learn as much as we can about each individual in order to know what their personal, relevant aspirational goals are. This is another place where the smartphone comes into the picture. It will become both a data rich environment and a data conduit to enable analytic systems to learn enough about you to help make those behavior change messages relevant. 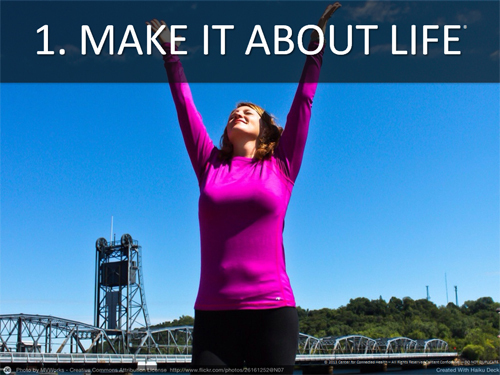 Don’t make it about sickness; don’t make it about health, even, but make it about life. Dr. Kvedar, when I read your earlier comment on the addictive quality of smartphones, I thought it was particularly insightful and have referenced it on a number of occasions. I also think your perspective here has the potential to move the needle. I think that immersing health into the normal flow of communications between patients and the people who care for them is the right view of the future. There is a lot to learn but a lot to be gained. Thanks for moving us in the right direction. YES, we do need to make the message more about the user’s life..more relevant. Interestingly, Dr. Segar explored a similar topic of motivation: http://bit.ly/1iKjVcS “..what gets you to start taking better care of yourself is often not what keeps you motivated day in and day out.” We have to do a better job of empowering people to relate healthy habits, including exercise, to immediate, relevant benefits–increased energy, uplift mood, confidence boost, etc.–to make everything else in life “better”. Eliminate the “should’s”! Can make it abt life w/o conflating dz mgt/prevention. When asymptomatic dz is present, we’re preventing something that doesn’t yet exist. When an event or other pt-evident sx (MI, stroke, SoB, blurred vision, whatever) has already occurred, there’s a veil of fatalism/denial/avoidance that interventions/communication must pierce every day. Most of us advocate a different strategy for “prevent what hasn’t happened” vs. “prevent what’s happened from worsening or killing you” because the context for introspection/abstraction differs significantly. You are correct in making this distinction between pure prevention and secondary prevention. the messaging and tactics are slightly different between the two. We need to be v.careful with this. Recently I had a close relation die and since then am implored via Google several times a week to insure myself (or others) for death costs. It is an unpleasant intervention in my life and reminds me of things I do not want to think about – I certainly won’t be buying insurance from those guys (Dela) as a result. So my internet is compelling/addictive but can turn me off as well as on. I think the key is to have positive messages and two-way communications: internet advertising is largely one-way. Addressing Laurie’s point. A TIA event such as blurred vision is now setting panic buttons in many places and a rapid screening and prescription of an arsenal of meds. Many patients are not fatalistic about this but shocked to their core and start trying to change their lifestyle. Unfortunately the hcps are not so good about follow-up and encouragement to continue or even on-going checks or information about what to do next. We need to be much more proactive and positive in our communication. The algorithms from Google and others are not perfect by any means. Your story is a disturbing one. But the concept is the right one and I have faith we can get there over time. Joe I find it freakishly interesting that you write this post given the parallel universe I am working in. Watch this video about my daughter and let me know what you think? You are spot on, and we think our platform will do just that. http://vimeo.com/79494990 Link in with me I will share more details! In addition to distinguishing between prevention and secondary prevention, it seems there could be many other ways to distinguish segments of the population. I would assume that a connected health approach that is successful for a 68 year old retiree with diabetes and hypertension who is uncomfortable with email and smart phones, might be very different from a successful approach for a newly diagnosed diabetic 13 year old girl who can’t be separated from her Galaxy S5. Age, technical aptitude, income, co-morbidities – and I’m sure there could be other factors that could influence stickiness and what “it’s about life” might mean. Is anyone doing research into connected health and this type of patient segmentation? thanks for these insights. Yes, we’re doing some of this work at our Center. Others, particularly those who have been commenting on this series of posts may be too. These comments go to the essence of what those outside healthcare grasp much more clearly than those inside, or so it seems. It is “about life” and it’s many facets as we travel through it. Recognizing this, our company has been on a quest to immerse technology into the normal flow of communications of people–people who are both parent and daughter at the same time–people who are being cared for and are caring for others, and people who increasingly demand and have information instantly at their fingertips. Just this week, our company has been involved in innovative projects around homeless students, domestic violence and elder abuse, hospital readmission reduction, medication therapy management, and the general topic of user generated health information. In each of these, the use of mobile technology is changing lives and the way our communities live together and behaviors are shaped. Our company and its product Connected for Life will succeed or fail based on our ability to integrate transformative solutions into people’s lives and the changing ways they communicate. So likely will much of healthcare as we know it today. My thanks again for the opportunity to participate in this discussion.